Fire fenders are a practical and functional barrier that will keep coal, ashes and dust safely contained, while also providing a border between the hearth and the rest of the room. They can be also be a decorative and attractive feature of a fireplace, as can be seen in our range of beautiful fire fenders. We have many different styles of fender in a range of metals, including cast iron, brass and polished steel, with some antique fenders combining different metals to add contrast and interest. These antique fire mantels are centuries old, in some cases, and have been reclaimed from Victorian and Edwardian houses. All have been lovingly restored to bring a genuine piece of history into your home. 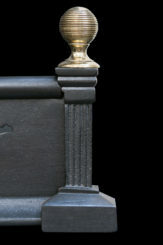 Many of our antique fenders feature intricate metalwork and carving, with ornate Art Nouveau or Rococo detailing that will fit perfectly into a period home. Some of these feature pierced metal with motifs or spectacular decorative mounts, which will bring an artistic touch to any hearth. For those who prefer a more contemporary style, we have many cast iron and brass fire fenders with plain, smooth lines that will fit into any décor. From classic railed fenders to antique fire mantels with wire mesh, our selection of unique and decorative fire fenders brings you the craftsmanship and quality of past times, beautifully restored to meet today’s rigorous safety standards.